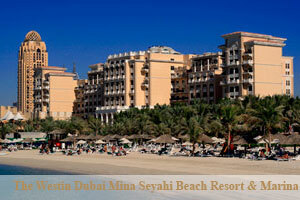 Occupying a prime location on Jumeirah Beach, the Westin Dubai is a 5-star design hotel. It features a spectacular resort pool, a 1200-metre private beach, luxurious rooms and 8 restaurants. Westin Dubai is 15 minutes' drive from the Mall of the Emirates. The Montgomery Golf Club is only 5 km away.